Dog of the Day: Pretty! Meet Pretty, our longest stay senior Pit Bull mix. She hasn’t had the easiest time in life and is somewhat undersocialized when it comes to new situations, environments and other dogs. With this in mind, potential adopters who are experienced with her breed and canine socialization would suit this lady to a tee. Pretty’s also looking for an energetic companion; this affectionate lady may be older but she is very, very active; she requires plenty of exercise and loves her play time (couch potatoes need not apply). 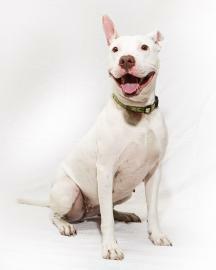 With a little patience and guidance, this Pit Bull mix will be a loveable forever friend. Will you be her guiding light? For more information on Pretty, please click here. This entry was posted in Dog of the Day, Toronto and tagged adoption, animal adoption, animal rescue, gta, rescue, toronto by Raquel. Bookmark the permalink.